To create wonder about space, and reflect on God’s presence everywhere. You will need a video of space (https://www.youtube.com/watch?v=b0lxbzgwW7I&feature=related). A photo of the astronaut Michael Collins (http://www.thespacerace.com/images/astronauts/collins1.jpg). 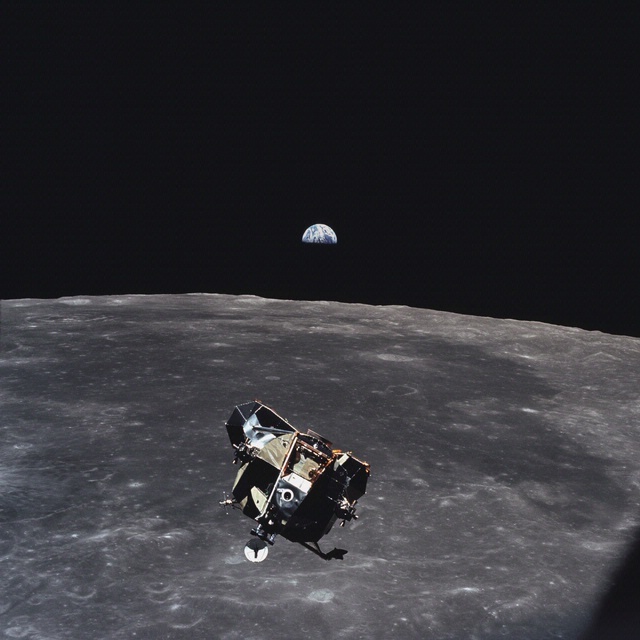 The photo Michael Collins took of the moon, the Command Module and the earth (http://www.nasm.si.edu/webimages/640/AS11-44-6642_640.jpg). Card cut-outs of the earth, the moon and a command module. There is a wonderful selection of space images on http://www.nasa.gov/multimedia/imagegallery/. As the children enter, show a video of the universe (e.g. from YouTube, as above, on silent). Ask the children if any of them would like to go into space? How would it be different from earth? What would eating be like? Drinking? Moving? If you were on your own in space, how would you feel? Show a picture of the American astronaut Michael Collins. Tell the story of how on 20 July 1969, Collins was part of the Apollo 11 mission to land on the moon. But while the two other men went on to the surface of the moon in a small landing craft or Lunar Module called the Eagle. Collins was left alone on the Command Module and orbited the moon completely on his own. Using three children to hold the earth, moon and Command Module images, demonstrate how this cut him off from the earth. Say that for 48 minutes while he was going around the moon, Collins was completely on his own in space, without view of the earth. Someone said that he was like Adam, because he was the loneliest man in history. Show the photo Collins took of the moon, the Command Module and the earth. The amazing thing was, while Collins was on the other side of the moon, he said that he wasn’t lonely. He felt confident, satisfied and really happy. Say that Christians believe that while the universe is huge and amazing to us, to God it is not. There is nowhere we can be alone in all of space and time. Thank you that space is amazing and beautiful. And thank you, God, that you fill each part of it.